The jewels of the Empress Eugénie  are for sale. Mr. Harry Emanuel has many of them at his establishment in New Bond Street and is now offering them to his customers. There is no concealment as to the late ownership. Mr. Emanuel had the magnificent collection he showed on Saturday direct from the empress, and many of the jewels in it have been familiar through portraiture for years. Few will read this announcement without regret. The early gifts from the emperor, the gorgeous diadem worn on occasions of semi-state, the costly offerings from reigning potentates, the small ornaments in daily use, and those of luxury and display, have all come to be appraised as merchandise, and to be sold for what they will bring. A sale of personal effects and the distribution of household goods always suggest a mournful contrast between their owner's past and present; and to thousands the fact that the ex-Empress of the French is selling her ornaments will speak with a homely significance which the more important circumstances attending fallen greatness lack. A lady parting with her jewels is a hard fact which is unmistakable, and it is possible that the popular sympathy will be more deeply roused than at any event in the imperial history since the flight from Paris and the surrender at Sedan . The collection is remarkable in many ways. That of the Prince Esterhazy  was more valuable, but for taste and workmanship combined with historical interest, it is not too much to say that nothing like it has been offered for sale in England within living memory, if at all. A mere catalogue of articles shows this. 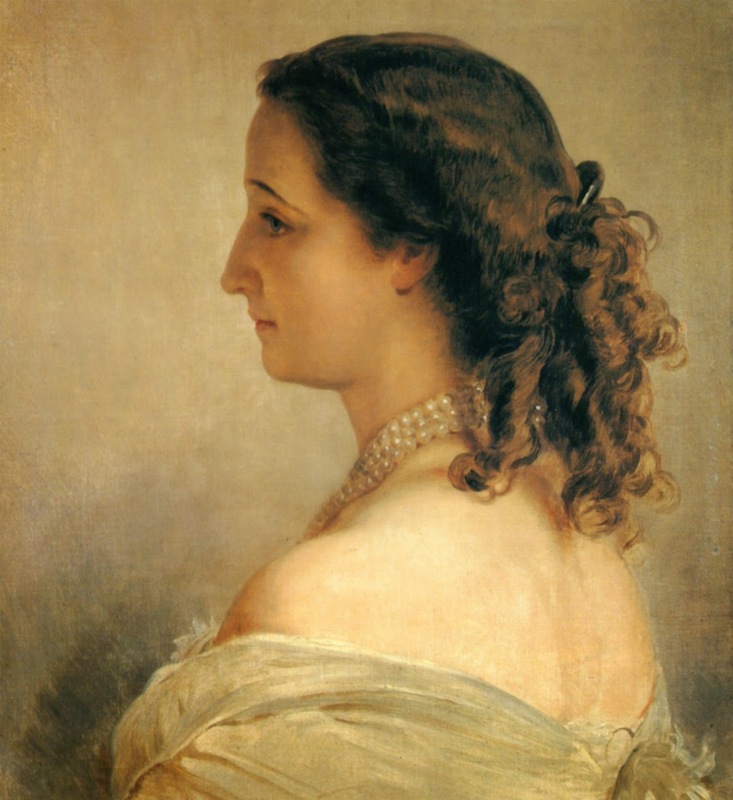 After the war between France and Austria in 1859 , and when peace was concluded, the Empress had a head ornament of diamonds worked into the form of an olive wreath, with black beads introduced in it at regular intervals. The olive branch told its own story of peace, and the somber beads with which the glittering brilliants were relieved were meant to express sorrow for the soldiers who had fallen. The workmanship is exquisite, and the stones are of the first water. This magnificent ornament is valued at several thousand pounds. It would be superfluous to pass eulogium upon the beauty or quality of the jewels. 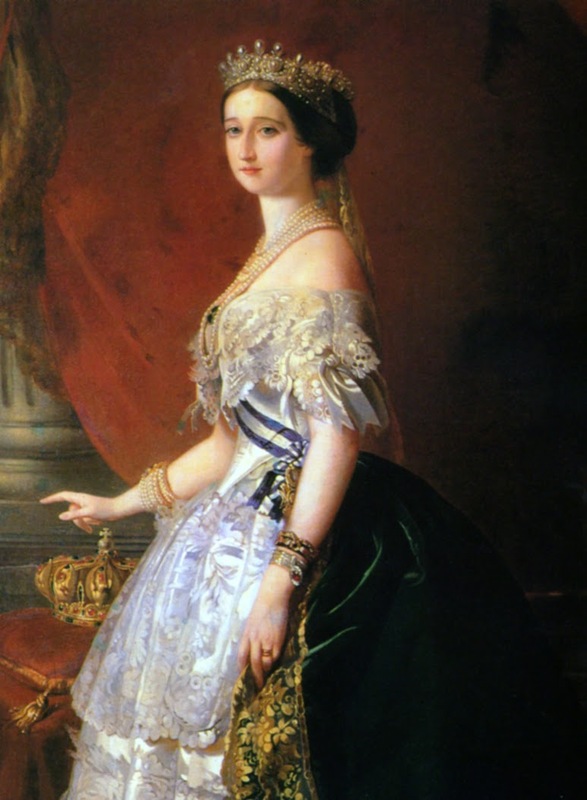 It is sufficient to know that they were many of them designed and worn by the Empress Eugenie in the days of her greatness, and that they nearly all speak of that personal taste for which she was famous. 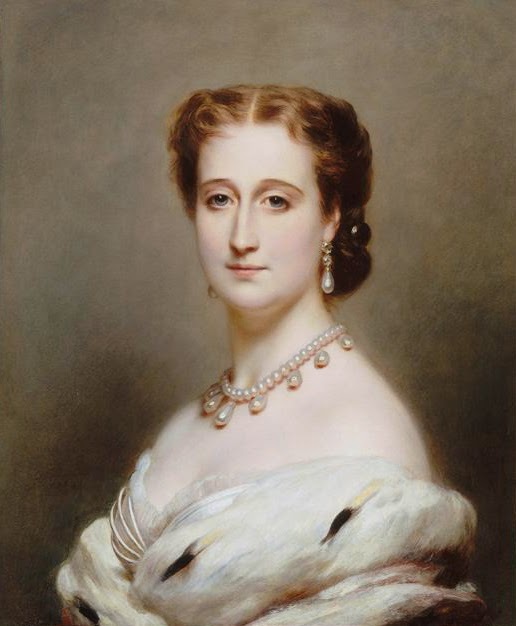 The famous cross, suspended from a pearl necklace, and represented in Winterhalter's portrait, is composed of emeralds of the finest color and purity, while the pearls all match each other in size, shape, and tint. Another necklace of black pearls of large size took years to collect, for the pearls match each other perfectly, and those versed in the subject know how great is the difficulty of procuring a sufficient number of these for a large ornament to be composed of them exclusively. There are pendants of large diamonds and pearls in fringes of ten, which were worn by the empress in combination with the crown jewels of France. Another splendid head ornament is composed of wheat ears in diamonds, with a center of cornflowers and grass also in diamonds, which were capable of being detached, and were oftener worn separately as dress ornaments than in their collected form. The watch with chatelaine carried by the empress is also for sale and forms a remarkable piece of workmanship. The back of the watch, which is the size of a small or "godless" florin, is jeweled with diamonds and colored precious stones, which the chatelaine matches; and the setting is peculiarly delicate and tasteful. The ear tops composed of immense single brilliants were a present from the emperor, as was a bracelet with a large sapphire in the center and surrounded by diamonds. The last article is a really splendid bauble, and contrasts favorably with another bracelet composed of many colored stones, which is said to have been presented by the Viceroy of Egypt . The massive simplicity of the one, and the rather barbaric magnificence of the other, convey a valuable lesson in the art of selecting jewels, just as the aigrette of diamonds, emeralds, and pearls presented by the sultan makes the exquisite head ornament of English make bought at the Exhibition of 1862 seem the perfection of taste. The wonderfully light brooch of brilliants made to represent an orchid with long pendant leaves and drops  is another ornament to which pure taste gives additional value. The same may be said of the necklace of large sapphires and diamonds with pearls attached to it, each pearl weighing some hundred grams; and of the large diamond anchors worn as shoulder ornaments  by the empress as patroness of the French fleet, and procured specially for the imperial visit to Cherbourg; and, indeed, nearly all the ornaments now offered for sale. There is not one which does not suggest state pageantry and imperial profuseness. The mere money value of the collection is from 60,000 to 80,000 pounds, but it must not be supposed that this represents the whole of the empress's stock of jewels. Many of these are too costly and imposing for any position in life but that which was recently occupied by their fair owner. The Empress of Russia  is understood to have purchased the celebrated suite of rubies, and it is known that there are many articles of enormous value still at Chiselhurst  which will be disposed of when a purchaser can be found. Most of the jewels now at Mr. Emanuel's might be worn with propriety by any lady whose purse is long enough for their purchase, while some, such as the watch and the emerald, ruby, and diamond hoop-rings, speak of daily use by the empress. The triumphs and homage these glittering gems have seen, at the atmosphere of splendor in which they have been displayed, are known to all; and the news of their dispersion will turn thoughts to Chiselhurst, and quicken the lively sympathy felt for the graceful, warm-hearted lady who has fallen upon evil days. 1. Eugénie de Montijo (1826-1920), a Spanish aristocrat who married Napoléon III, was the last Empress of the French. Napoléon and Eugénie were on the French throne from 1852 to 1870. 2. During the Franco-Prussian war, Napoléon III surrendered to Prussian troops on 2 Sep 1870 in the aftermath of the Battle of Sedan; two days later, the Third French Republic was proclaimed in Paris. The former imperial family went into exile in England. 3. In 1867, jewels that had belonged to the late Hungarian aristocrat, Paul III Anton, Prince of Esterhazy, were sold; the auction attracted a great amount of attention and the jewels sold for remarkable amounts of money. 4. The Franco-Austrian War, better known as the Second Italian War of Independence, was fought in the spring of 1859 in what is now northern Italy. The French sided with the Italians, including Vittorio Emanuele II and Garibaldi, against the Austrians. The French gained Nicoise and Savoyard territory from the Italians; the Italians gained Lombardy from the Austrians. 5. The Egyptian viceroy during this period used the title of khedive; you'll be familiar with gifts of jewelry coming from various khedives of Egypt. The person referenced here is probably Isma'il Pasha (1830-1895). 6. You can see images of this brooch at Ursula's website. 7. The diamond anchors ended up in the collection of the Newcastles. You can see the Duchess of Newcastle wearing them pinned to her coronation robes in 1937. 8. In 1872, the Russian empress was Maria Alexandrovna (1824-1880), born Marie of Hesse and by Rhine. 9. The exiled imperial family lived at Camden Place at Chiselhurst in Kent. Napoléon III died there the year after this article was published.